The just-concluded 2012 World of Asphalt and AGG1 expositions were an unqualified success, posting record numbers for attendee registrants as well as amount of exhibit space, number of exhibitors and number of education session tickets sold. “Attendees and their companies know that the industry connections at World of Asphalt and AGG1 are invaluable to meet the business challenges still facing our industry sectors in the U.S. and world economies," stated Show Director Melissa Magestro. "Attendees and their companies understand the importance of learning and networking to stay sharp and take advantage of a recovering economy. They know that the industry connections at World of Asphalt and AGG1 - between buyers and sellers, peer-to-peer and with industry experts - are invaluable to meet the business challenges still facing our industry sectors in the U.S. and world economies," stated Show Director Melissa Magestro. The co-located World of Asphalt Show & Conference and AGG1 Aggregates Forum & Expo were held March 13-15, 2012 at the Charlotte Convention Center in Charlotte, North Carolina. 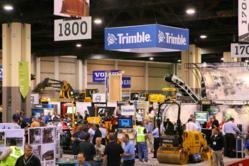 Record attendee registration numbers totaled more than 6,500 at show close. Registrants came from all 50 states, all 10 Canadian provinces and more than 50 other countries worldwide. More than 35 percent were company presidents/owners, vice presidents, general managers or chief financial officers, and all together more than 84 percent of registrants were in managerial roles. The show floor covered a record 115,000-plus net square feet of exhibit space (10,684 square meters) - a 30-percent increase - taken by a record number of 408 exhibitors. Leading companies showcased their newest products and technologies aimed at the aggregates, asphalt, pavement maintenance and traffic safety industry sectors. Education is a cornerstone of the shows and a record 6,200-plus education session tickets were purchased by attendees for the shows' signature learning programs: AGG1 Academy, Asphalt Pavement Conference and People, Plants and Paving Training Program. More than 20 industry organizations were official supporters of World of Asphalt and AGG1, and the shows are industry-owned and operated. "These are industry-driven events where participants have a say in planning so the shows best meet their needs. They can feel these are truly their shows," Magestro noted. For more information, visit the show websites: http://www.worldofasphalt.com and http://www.agg1.org. Editor's Note: For PHOTOS go to Flickr: http://www.flickr.com/photos/worldofasphalt/.